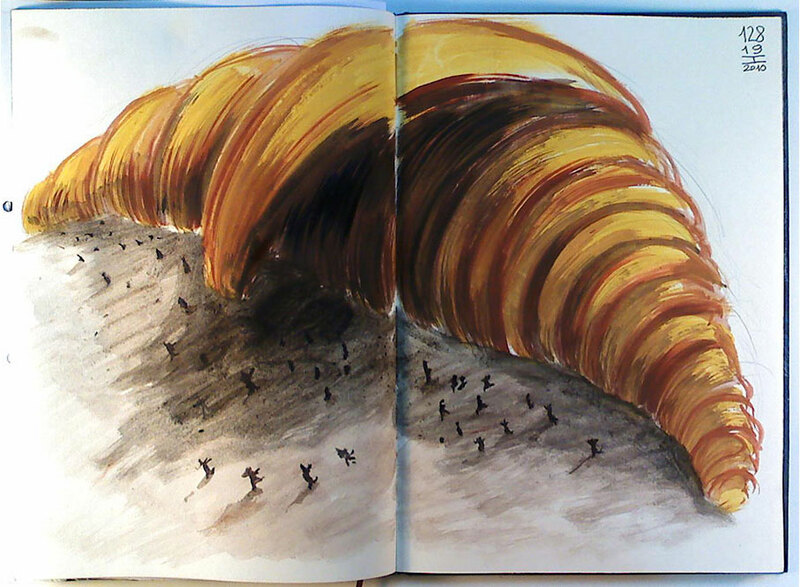 hoy presentamos el croissant que esta mañana se transformó en un enorme tsunami y girando sobre sí mismo arrasó el plato llevándose por delante todas las migas y granitos de azúcar convertidos en personas y pueblecitos costeros del tercer mundo. ¡Luego me los comí enteritos, el croissant y todo lo demás! ¡ñam! New section: “Everyone likes to play with food and make up stories”. Today we present the croissant, this morning it turned into a big tsunami, that rotating on itself devastated the plate, running over all the crumbs and sugar grains that have turned into people and seaside towns of the Third World. Then I ate them all; the croissant and everything else! Yummy!